Ambient Noise Generators — Work Smart and be Remarkable! Music is a wonderful way to relax, to increase your energy, or to change your mood. But you can use it also to get focused. Especially, natural sounds from, for example, falling rain, a brook in the forest, or waves crashing on the shore are great for that. Interestingly, also all kinds of artificial noise can help you to get into the flow and to stay in there. Recently more and more so-called ambient noise generators have been made available online. 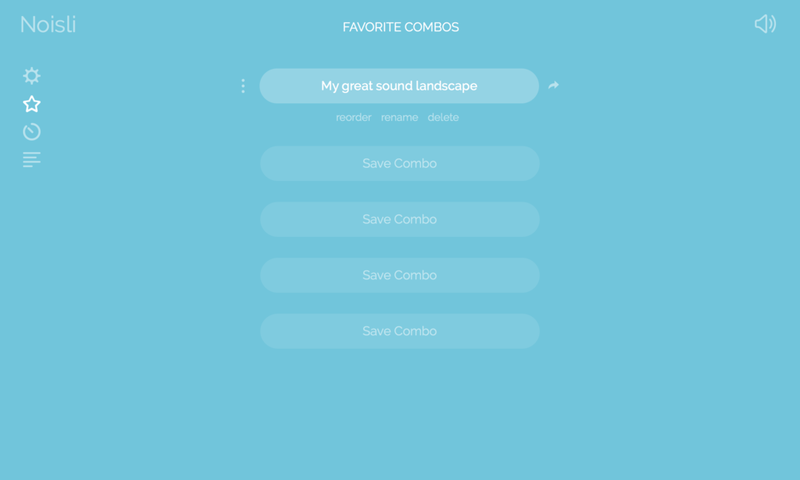 They allow you to choose and mix different sounds to make your own sound landscape that helps you to get focused. Although a lot of them offering some kind of paid premium service, all of them also provide a free set of ambient sounds. Since there are so many out there and everybody's taste is different, I thought to best would be to simply list some of them, describe their features and you can pick your favourite. To test them, simply click on the screenshot. This was the first one that I discovered and it got me immediately hooked. It provides the sound of a coffee shop. You can hear the unintelligible murmur of people, the clinkering of cups, and the general ambient sounds of a café. In the free version it allows you to choose from three different coffee shop locations. There is also a free iOS application available, see link. Defonic allows you to mix various noises into one background sound landscape. You can choose from 21 different sources including the sound of purring cats, fire crackling, and rain. Find your best combination and enjoy your deep work session. Defonic also features a timer. In addition, Defonic offers videos of soothing places and their corresponding sounds. They are made in such a way that they don't distract. I use them for my second monitor and it feels like looking through a window. The videos also provide additional sound FX that you can switch on/off. Another coffee shop sound simulator. You can choose from three different locations. In addition, you can mix in light piano sound, tweeting birds (open-air bistro), sound of waves (ocean lounge), a fireplace, and rain. Rainyscope shows a picture of a tree. You can change to one out of the four seasons. In addition, you can choose canicule (i.e., a very hot day). The sound effects change depending on the option that you have chosen, for example, summer comes with rain and thunder and "canicule" with birds tweeting. In case of rain you see animated drops running down your screen. It also features a timer that goes for one hour and you can hide the option menu. 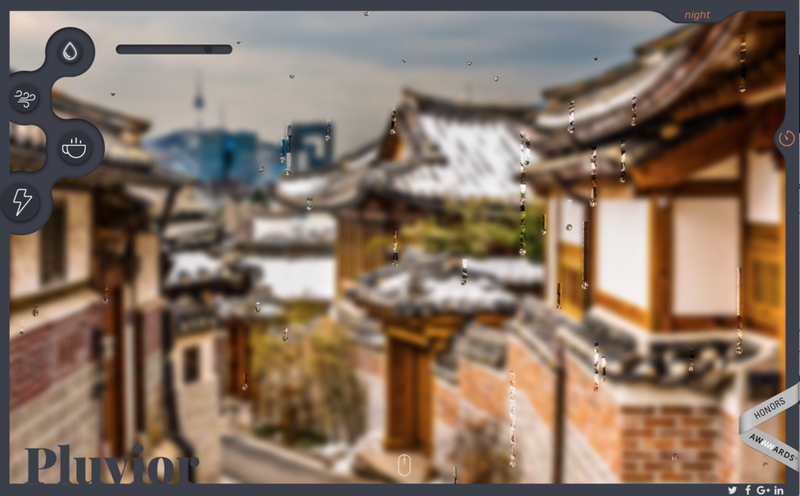 Pluvior allows you to choose between two different background scenarios (i.e., day and night) simulating rain drops running down your screen (as with Rainscope.com). You can add noise from rain, wind, thunder and coffee shop murmur. There is also a timer running down from 60 minutes. There exists also a light version without the raindrops and a simple background. 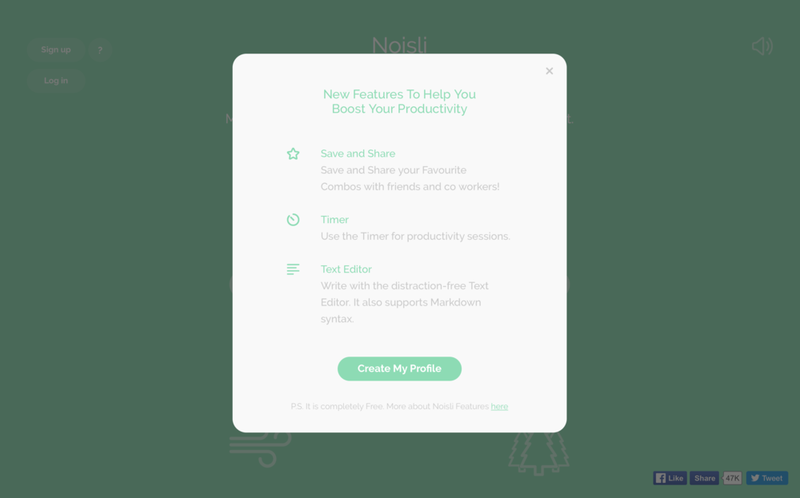 At first look Noisli looks like yet another ambient noise generators. 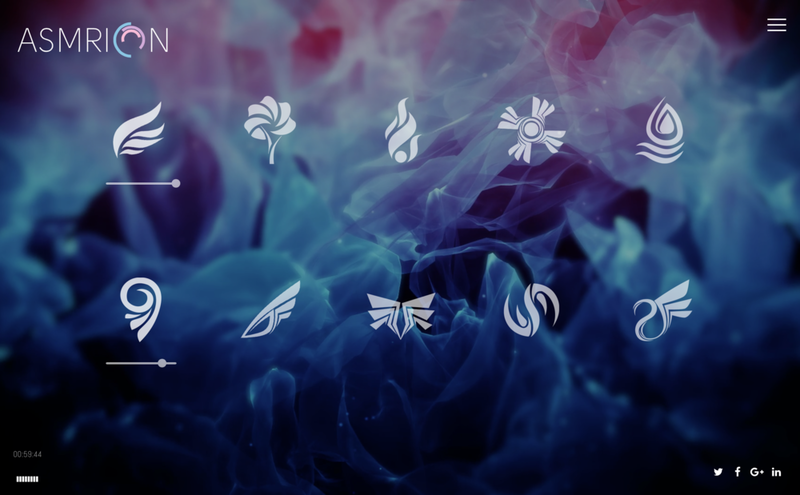 It provides a range of sounds you can choose from and mix, e.g., rain, thunder, forest, but also more exotic ones like different types of noise (you have to scroll further down to see them). But Noisli does more. It slowly and smoothly changes the background colour and it has three presets (Random, Productivity and Relax). However, maybe the coolest part is that you can store up to 5 presets. You can even share them via social media. To use this feature you have to sign up, which is free. In addition, signing up gets you a timer and, maybe more interesting, a distraction free text editor (currently in Beta) with the possibility to store and download the text. 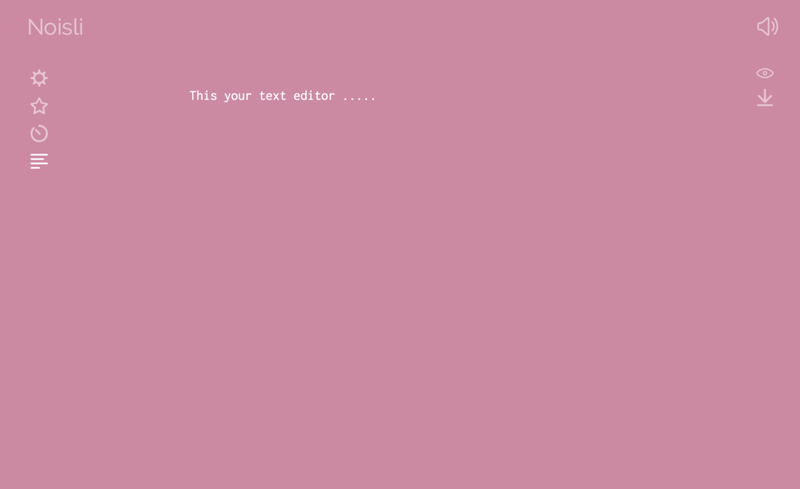 Furthermore, you can stop the background from changing, which could be otherwise a little bit annoying when writing. This is another very simple ambient noise generator. You can choose from 10 different sounds. Most of them are fairly standard, but it also features singing bowls, which is great for meditation. However, it has an options others don't have. It is called "meander". When switched on, the volume of each sound will gently wander up and down at random. As the name suggests it mixes Jazz and the sound of rain. You can change the volume of both the rain and the music. While there are not options for other types of ambient noise, you can choose from a variety of Jazz like Swing Jazz, Jazz with Piano, with Jazz with Saxophone, Vocal Jazz, and Electro Swing. 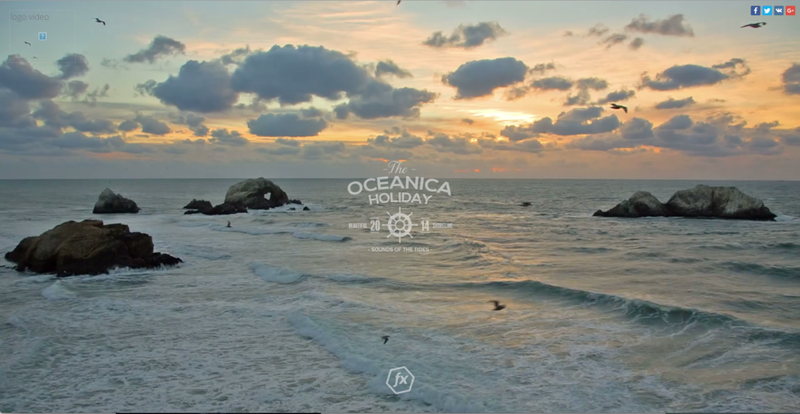 There are additional websites with the same interface, but with different music. They are Relaxing Beats to chill, Epic Music for workouts, and Seasonal Christmas Music with the sound of an open fire place to get into the mood. If you prefer artificial noise you should check out Concentr.me. You can choose from six different types of noise, i.e., white, grey, blue, violet, pink and Brown(ian) noise. It also features a Pomodoro timer. By the way if you wonder what these colors mean, have a look at Colors of Noise on Wikipedia or this Wired article. 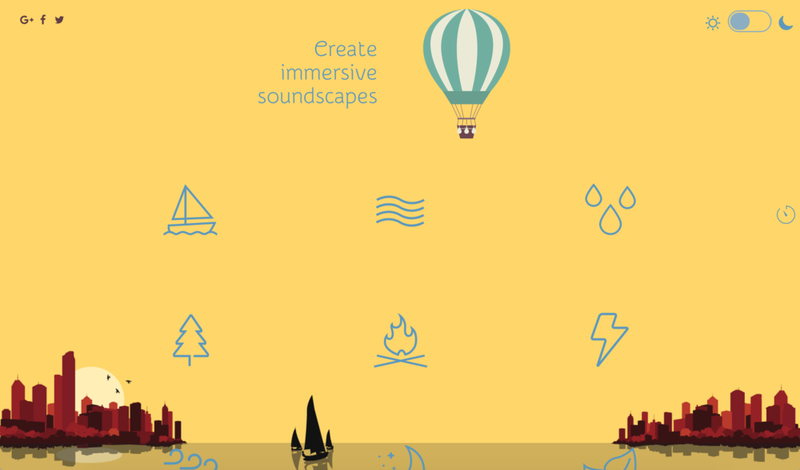 This ambient sound generator has a beautifully animated abstract background. The options for sounds to mix include standard ones like wind, waves, and fireplace, but it also offers more peculiar ones like barbershop, ripping paper and walking on a carpet of leaves. It also features a timer set to one hour. Ambicular offers a very interesting animated background. It shows part of a forest, a little bit out of focus, augmented by animated circles and lines. 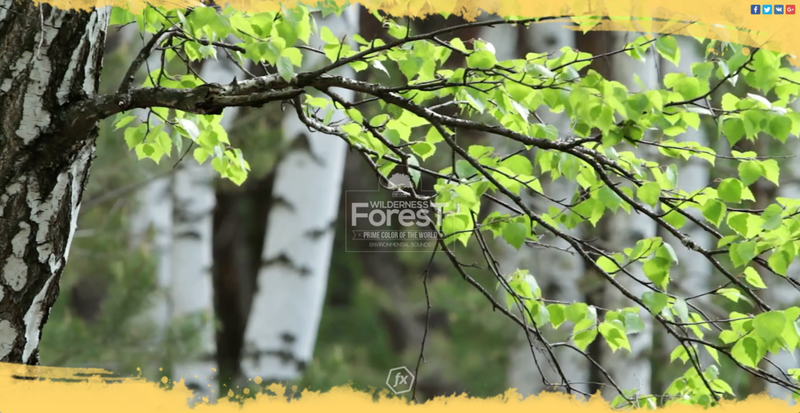 Regarding sound options, you can choose from five, i.e., forest sounds, leaves rustling, crickets, wind and forest birds. There exists also a sister website called Magic Cone, which shows a different picture, but with similar animations. The sounds you can choose from are slightly different as well, i.e., forrest, two different birds, sound of bugs, and sounds of night. This is the mother of all noise generators. If you feel that the ones presented so far are too simply or do not offer sufficient options, Mynoise.net, is your choice. However be warned! There are so many sounds and possibilities, it is easy to fall into fiddling mode and, most likely, you will not be very productive at the end. The best way to start using it is to look at the tutorial videos. The webpage features a really nice search function. Either you type a keyword like "water", "winter", etc. or you can choose from 10 predefined categories, including "Noise Blocker", "Meditation", and "Eerie" – all represented by different, little symbols. After choosing one you can adapt the sound either manually by moving the sliders, or you can click on one of the presets on the right side. You can even save your own presets and retrieve them later. Finally, this is one is a special one and I was not sure if I should include it or not. The reason is I am not sure if this one can help to increase your focus, but I thought, everybody is different and there might be people who would really enjoy it. Horrorli features only sounds that you typically hear in horror movies and horror games. You have 12 options including whispering, singing of creepy little girls, a squeaking swing, zombies and many others. Enjoy it and don't blame me for any heart attacks. There are many more noise generators out there and almost weekly new ones show up. Just simply google for "ambient noise generators" and explore. A lot of them also have an iOS/Android application for offline use and premium subscriptions for additional features and options. Some even have an application for the Mac. So, if you really like one, please consider to support the makers of these wonderful tools financially by buying their paid versions. I also wrote about the power of music to increase your productivity in general in an other blog post, which might be interesting for you. Do you know of any cool noise generators? Please share them with everybody in the comment section.